Following on from Nordic Walking and the delights of Tracking poles, our attention now turns to Resistance and Strength training. For resilience and wellbeing in later years we offer this short guide. 1. Q: What exactly is Resistance and Strength Training? Anything which involves exercising the muscles against a form of resistance or friction. Exercise is done by repetition of actions done regularly. 2. Q: Is it suitable for later years? Yes but only with certain provisos. 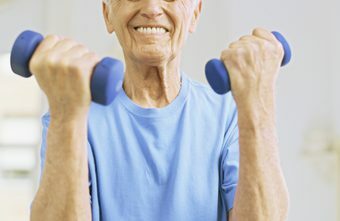 People do exercise with weights all the way into their 70s and 80s, even if they have to rely on a walking stick. Be assured the equipment used to strengthen muscle tone are not just used by professionals and body builders. 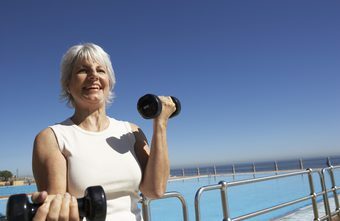 Whatever your age, established exercise regimes can be adapted to your needs. 3. Q: How long should a session be? It is suggested as little as 25 minutes of activity a day for 4 days a week at home is sufficient but everyone will have different tolerances. 4. Q: What equipment should I use? 5. Q: How should I approach weights? Keep them light and only with experience start increasing but only if you feel comfortable. Avoid weights that are too heavy otherwise you may cause yourself an injury and at best, your workout will be less affective on your muscles. Using weights which are more manageable will prevent back problems and stiff joints from forming. If you are arching your back too much, swinging or creating positions your body isn’t used to, you know you are straining. Once you feel pain, the simple thing to do is to stop exercising. You can maintain control without rushing. 6. Q: How can I pace myself? The trick is to start small and develop your repetitions by increasing them slowly. Follow a simple routine suited to your needs. Music is a good idea to help set an appropriate speed. Establishing a time target helps to limit exertion before building up your workload if necessary. 7. Q: What do I do if I have mobility problems? Sitting in a chair is fine for learning repetitive actions with just an arm and/or leg. 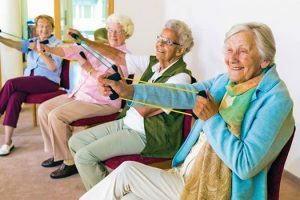 Alternatively as we get older, as movement and flexibility become more challenging, it might be worth making a note of the movements you are still able to do regularly and sticking to them. Muscles can be coaxed into life after a period of rest by rubbing arms and legs which will also improve your circulation.